Ea O Ka Aina: Trump - the lesser of two evils? SUBHEAD: My conscience can be clear voting for who I really believe should be president - Jill Stein. Image above: Bill Clinton will be a player if Hillary is elected. From (http://www.eurweb.com/2016/08/hillary-still-held-accountable-bills-crime-bill/). Choosing the least of two evils can make sense in some circumstances... but not all. Certainly the option of choosing to commit a venial sin is preferable to committing a mortal sin. And often, given the blurry nature of the "real world", choosing a little bit of compromise is better than choosing a lot of compromise. However, given the current political reality in the United States we are going to have either a neocon or a neoliberal running the country into the ground. Pick your poison! I've decided to vote for the Green Party candidate for president - Jill Stein. I've been a Green Party supporter since the 1990s. See Linda Pascatore's article on the Chautauqua County, NY Greens organization from our old publication "The Gobbler" for the (http://www.islandbreath.org/TheGobbler/Articles%20Published/02%20Greens/00%20GR%20Green%20Values/gr_00_Ten_Values.html). I have no substantial problem with anything I've read or heard Jill Stein say. If I have to make one criticism of her policy positions, it would be that she is a little too optimistic about our ability to achieve the goals she has in mind. That said the criticisms are plenty. Most who consider themselves well reasoning liberals argue that voting for Jill Stein is merely a vote for Donald Trump. The Clinton supporters argue if a substantial number of Bernie Sanders supporters vote for Stein (as well as those already committed to radical change outside the Democratic party) Hillary Clinton will lose the election and Trump will be elected. Given the choices we have, and the reality at hand, that is probably true. We will be doomed to a Trump presidency. But there is an upside. Trump is a stupid, greedy, self absorbed fool who is despised by the Deep State (the real power brokers outside of party politics). The Deep State includes parts (if not all) of the Pentagon, CIA/NSA, State Department, Think Tanks, as well as corporate, banking and financial elites. For the most part these "players" are supporting Clinton and her brand Neo-Conservative, Neo-Liberal politics. Maybe we should just start calling this team Neo-Political. It certainly is not the America it purports itself to be. Donald Trump spews outlandish, inconsistent and often insane rhetoric. It seems as if the oligarchs of the Deep State look at Trump as a fool and a danger. They will have a much less effective puppet if Donald Trump is leading the nation than if Hillary Clinton is. As an aside - can you imagine Bill Clinton haunting the White House for eight more years. Most of the republicans currently in congress will oppose any of the crazy legislation he is proposing. It is likely that without congressional support, or that of the Deep State, Donald Trump will be a very ineffective president. For all his rhetoric, nothing in his agenda will be accomplished. And that would be good. 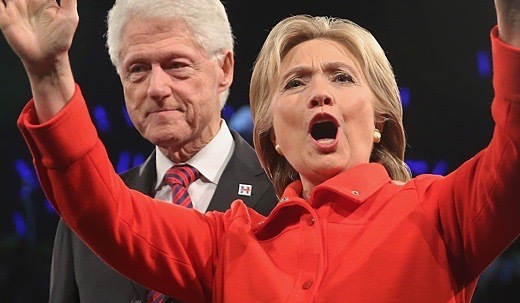 In fact it might be better than a Hillary Clinton presidency, in that her (and don't forget Bill's) effectiveness in laying waste to Democratic liberalism will push us further back into the conservative agenda of planet destroying politics than Trump could ever effect. Trump - the lesser of two evils. My conscience can be clear voting for who I really believe should be president - Jill Stein. You seem to have a perspective I don't: can you imagine Bill Clinton haunting the White House for eight more years. Silly. It seems a little weird to me to imagine First Gentleman Willam Clinton with nothing to do outside the Oval Offise during an important meeting just wishing for an invitation to join the conversation.